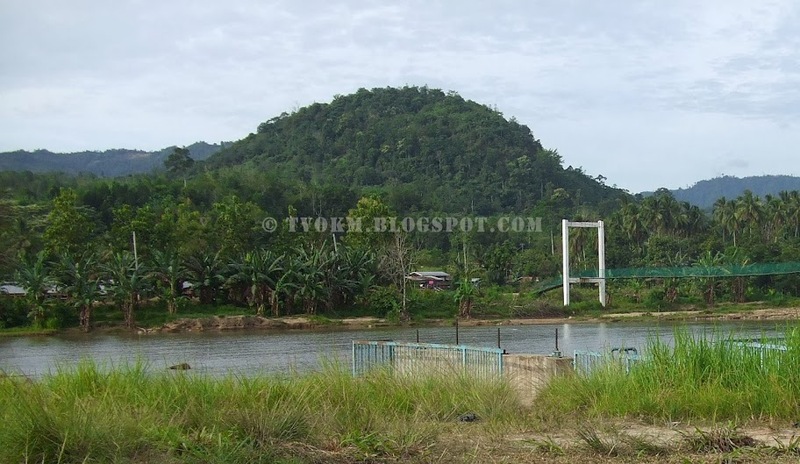 Sagang Hill is a small hill located in Kg.Simpangan, Kota Marudu about three kilometers from the town. It is over a thousand feet high, with steep cliffs almost on all sides. The peak area is about ten acres. 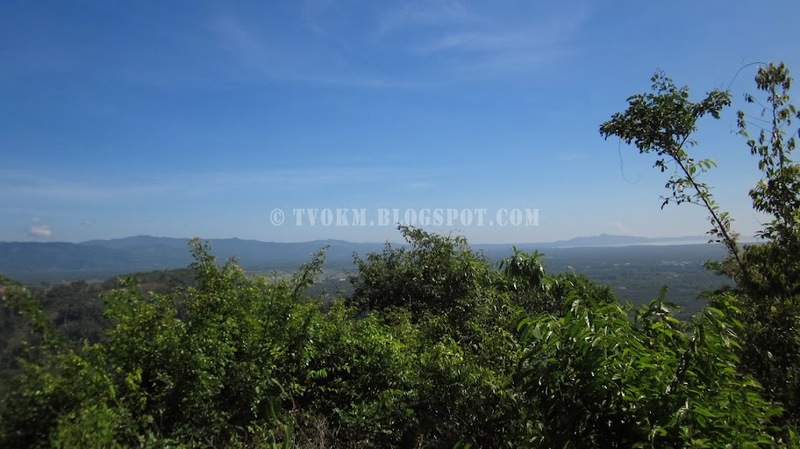 It is clearly visible from Marudu Plain and from the top, it has a panoramic view of the lowland of Kota Marudu, Matunggong and Pitas offshore, and it stretches all the way to the Kudat sea, Banggi and Balambangan Island. Kg.Simpangan comes from the Malay word "intersection", meaning 'junction', because it is located between the confluence of Pangapuyan River that flows from the South and Taaran River from the Southwest which joins in Garud to form the Bandau River. Sagang hills are located on the east of Pangapuyan River. Traders coming in from the sea upon reaching Kampun Simpangan either have head south or south-west to reach the inhabitants along either Garud river. At the summit of Mount Sagang, there are mysterious piles of river stones that is conical in form with a base diameter of about fifty feet and a height of about twelve feet. The total volume is about three hundred and fifty cubic meters of rock or equivalent to 30 ten-tonne trucks with full load. Each rock typicaly weighs less than three kilograms and the other weighs less than ten kilos, but there are some very large rocks that can be seen at this time is about thirty kilograms in weight. In the 70's, there was an unsuccessful attempt by a treasure hunter to tunnel through the mound from the top. The tunnel only went half-way through. In the 90's, another attempt was made and this time, the treasure hunters dug two tunnels at the ground level which crossed at the centre of the mould. The tunnels ran in the east-west and north-south directions. A few large stones about thirty kilos in weight were uncovered during the excavation work. There were indications that there had been excavation carried out a few feet into the ground itself. 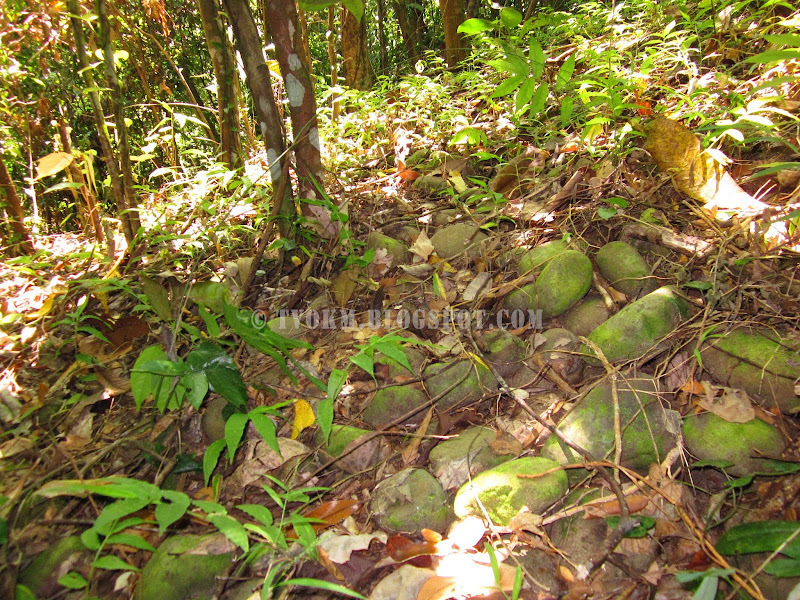 However, the piles of river stones at the top of Mount Sagang is a mystery. To hoard as much as the amount of stone on top of a steep hill, climbable road is just over one kilometer to Garud, requires a large amount of manpower and logistics to carry out the job. None of the groups known by local people or a combination of several tribes had carried out the task. It is impossible that the work was done by the residents there. Besides the piles of iver stones there are also red granite which is not that much harder scattered nearby, where size and weight are the same as the river stones. 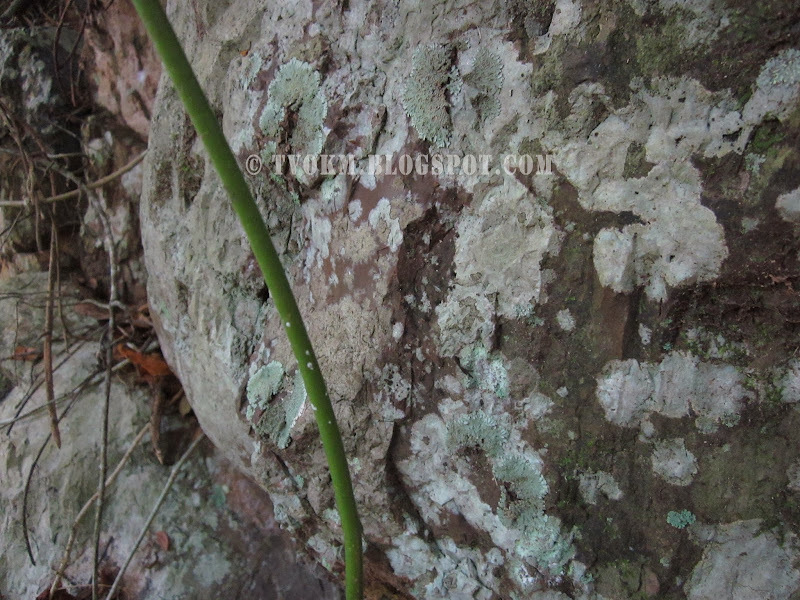 However, there is the story of the Tindal tribe in Kg.Simpangan about the piles of river stone on Sagang hill which is the remains of a weapon that destroyed the enemy ship which docked at the foot of Sagang hill. This is the story.